Another upcoming device from the Canvas Bolt series has been spotted online, on Micromax’s official website, the Micromax Canvas Bolt A40. By the looks of it, the device is going to be an entry-level Android smartphone. The device will come with a 4.5 inch touchscreen and will run on a rather outdated Android v2.3.5 OS. The phone is expected to be available in the coming weeks for a price of around 5,000 INR, which we estimate looking at the specifications. The Canvas Bolt A40 will come with a 4.5 inch screen with an FWVGA resolution of 480×864 pixels. The device will come with a rather austere (by today’s standards) 2MP rear camera, where an LED flash would be consolation. The Canvas Bolt A40 will feature a front facing camera of 0.3MP (no 3G connectivity, however) and would come powered by a single core 1GHz processor. 512MB of RAM along with the same amount of internal storage (75MB available for user files) will find place on the device, with support for expandable memory via microSD up to 32GB. An average sized battery of 1500mAh would find it’s way under the hood. As is the case with any other budget device of today, this one too will feature support for dual SIMs. The device’s connectivity features include WiFi, Bluetooth, micro USB port, 3.5 mm audio jack and FM Radio. The phone will come with a host of pre-installed apps such as EYE Room, M! Live, 3in1 Bubbles, Opera Mini , Hike, and Spuul, as you can find on the site’s listing. There is no word on availability yet, but the device is expected to be available in the coming few weeks. It is being speculated that Micromax has already imported the first batch of this device into the country, which makes us believe it won’t take more than 15 days for the device to find its way through retail channels. 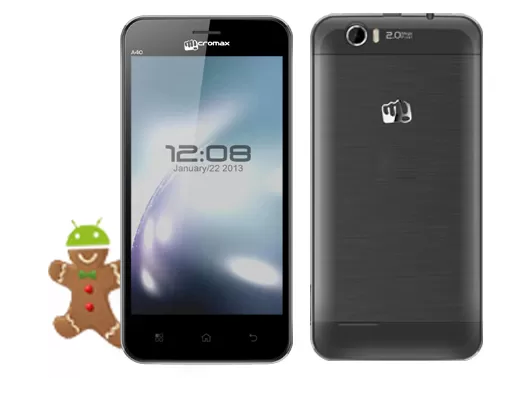 Based on the provided specifications, the device will find competition in the market from devices like Karbonn A8 and A9, OptimaSmart OPS 80, Zync Clous Z401, etc. Micromax will have to be a little aggressive with pricing if they want to grab the market share with this phone.